Do we really care about who is around us? Many social media companies have envisioned the internet as a facilitator for real world interaction — a way to make it easier to see the people we care about. So far, though, it’s been tough to get a critical mass of users interested in features like these. Can Facebook do better? Last week, the company (s fb) announced that it would roll out a “Nearby Friends” feature for mobile, essentially allowing users to not only broadcast their approximate location, but to search for users nearby to meet up with. The feature itself could provide Facebook with a lot of rich data on how users explore their immediate surroundings, opening the platform up to push geolocated ads and other content that could prove to be a big boon for Facebook over time. For Nearby Friends to work, though, people will actually have to use the feature: In the past, bigger companies have phased out the technology and smaller companies have shut down due to lack of traction. Here’s a quick retrospective on a few companies that have attempted to make people discovery happen, and the challenges in taking the feature mainstream. 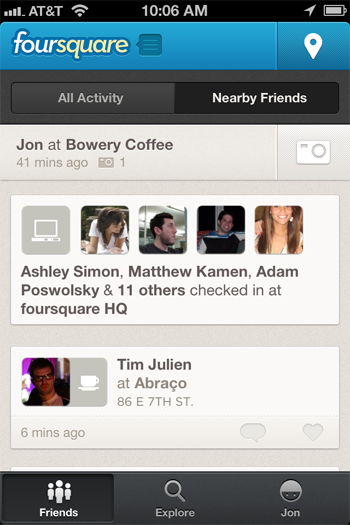 Early iterations of the Nearby Friends concept are found on Google (s goog) — with its Latitude Feature — and Foursquare. Both technologies were launched in 2009, as Google brought Latitude to its mobile Maps product and Foursquare launched at South by Southwest. Both services were somewhat primitive. Google Latitude started as a way simply for people to share their location, but became more sophisticated over time. Meanwhile, Foursquare’s technology could only filter friends who recently checked in at a nearby location, rather than seeing everything in real time. Neither company could get its location-based people discovery features off the ground. Google finally shuttered Latitude in August 2013 and rolled some of its features into its new Maps product. Foursquare, after actually removing and reinstating its Nearby Friends feature in 2012, has shifted focus away from check-ins. Most recently, the company has doubled down on passive technology, turning the platform into a recommendations app rather than a gamified social network. It’s also recognized the value of its location data, most recently inked a licensing deal with Microsoft to generate revenue. In short, while Foursquare’s Nearby Friends never really died, the app’s decision to shift made it somewhat toothless. But the changes made by Google and Foursquare were well-informed by their explorations into people discovery, even if the features themselves never took off. The real lessons about the sustainability of Nearby Friends are found in the batch of apps that managed to break through at South By Southwest in 2012: Highlight, Sonar and Glancee. These “passive ambient location” apps that constantly fed personal and social data about users nearby, the three apps made a splash at SXSW — an arguably ideal use case, since a high concentration of early adopters was available to test out the services in Austin. Facebook acquired Glancee in May of 2012, and now members of that team worked on the Nearby Friends feature. Highlight is still up and running, although it continuously struggles to recreate the buzz it had in Austin, and it doesn’t share its current user data. Its last big push was in December of last year, when it unveiled Highlight 2.0 — a “smarter” version of the app designed to dynamically adjust the radius of users and filter out unwanted alerts. But, despite a boost into the Top 100 apps in the U.S. on iOS days after the announcement, the app hasn’t seen anything close to sustainable popularity. Under the umbrella of Facebook’s cash flow, Friends Nearby doesn’t need to carry the company, but it does need to transcend the growth problems that have plagued the trend from the beginning. The best (and most successful) use cases of a Nearby feature might be found in the dating apps Grindr and Tinder. Grindr, a gay dating app released in 2009, primarily populates its app based on proximity: 100 nearby users show up in a user’s feed, prioritized by distance as close as dozens of feet away. 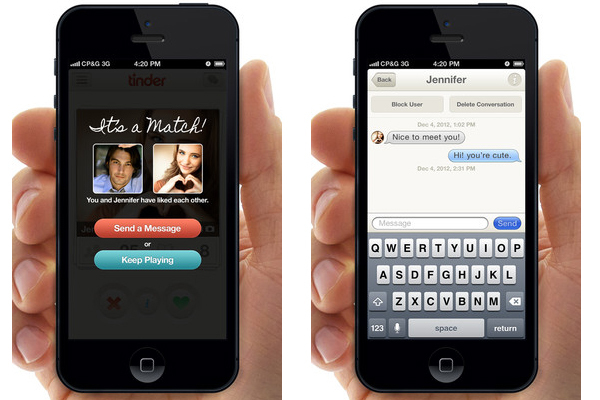 Tinder, a mobile dating app that has quickly become a go-to for college and twenty-somethings, also factors in location to populate the app with singles who share social graph connections or similar interests. While these apps have successfully deployed location technology to bring online social interaction into the real world, there’s one caveat: they help users meet new people, not find friends they already have. In this crucial aspect, Grindr and Tinder really aren’t like Facebook Nearby at all — they serve a different purpose, meeting new people, so their features are used with different intent. But Facebook Nearby can learn from these apps in a crucial way: making discovery addictive. If Facebook can manage to make its Nearby feature fun and simple enough to entice users to check it multiple times per day, then it has a better shot of becoming a feature that more people will use, which will increase value over time. Facebook could do that by bringing surprise into the app — say, alerting users to when friends who aren’t normally nearby are in town, or randomly generating the information of a friend of a friend with similar interests. By incorporating real discovery into people discovery, not just nearby friends, Facebook might finally craft the right mix. Â« Aux Ã¢mes bien nÃ©es, la valeur nâ€™attend point le nombre dâ€™annÃ©es Â» dit-on souvent. Avec ce jeune enfant de 14 ans cet adage se vÃ©rifie. Il est de nationalitÃ© togolaise et est orphelin de pÃ¨re et de mÃ¨re. Bright KPOHA a apparemment lâ€™art et le talent dans son sang. Cet enfant est capable de vous faire votre propre portrait en moins de 15 minutes, rien quâ€™en vous regardant en face. Et si jamais, vous lui donnez votre photo ou une photo quelconque vous serez Ã©merveillÃ©. Câ€™est donc pour lâ€™encourager, le faire valoir et chercher notamment des producteurs Ã ce jeune mais grand artiste que les responsables du Festival International de Films et des Arts du DÃ©veloppement ont dÃ©cidÃ© de lâ€™inviter Ã lâ€™Ã©dition 2012 de FIFARD qui se dÃ©roulera du 10 au 17 novembre 2012 Ã LomÃ© et dans dâ€™autres villes du Togo. Â« Jâ€™ai commencÃ© par dessiner trÃ¨s tÃ´t, dÃ©jÃ Ã trÃ¨s bas Ã¢ge, jâ€™aimais dessiner tous ceux que je rencontrais et les photos qui mâ€™intÃ©ressaient. Je peux voir les gens Ã la tÃ©lÃ©vision et les dessiner ou encore leur photo ou les voir en faceâ€¦. je ne sais pas comment cela mâ€™arrive, mais câ€™est spontanÃ© .Ca me vient comme cela sans que je ne rÃ©flÃ©chisse. Ce que je regrette câ€™est la mort de mes propres parents. Je suis orphelin… Câ€™est dommage. Je suis en 5Ã¨me, jâ€™ai 14 ans. Mais jâ€™aime dessiner. Je peux dessiner tous ce que je vois. Peut Ãªtre que moi aussi câ€™est mon don de Dieu. Les gens disent que je dessine bien. Moi aussi cela me fait plaisir. Je crois quâ€™un jour je deviendrai un grand artiste. En tout cas, moi câ€™est mon dÃ©sir aussi Â» explique lâ€™enfant gÃ©nie dans sa langue maternelle (EwÃ©) mÃ©langÃ© de quelques mots franÃ§ais. Les responsables de FIFARD ont expliquÃ© les raisons de leur invitation par le souci de promouvoir les talents de lâ€™enfant, de le prÃ©senter au monde entier et de susciter les rÃ©actions de bonnes volontÃ©s qui voudraient aider cet enfant Ã rÃ©ussir ses Ã©tudes et son art et Ã se perfectionner encore plus. Et quand les journalistes poussent la curiositÃ© et demandent au jeune Bright KPOHA de dire son rÃªve, il rÃ©pond tout simplement : â€˜â€™dessiner un jour tous les grandes personnalitÃ©s de mon pays et du monde et leur remettre leur portrait si possibleâ€™â€™. Le FIFARD est un festival international pluridisciplinaire qui a Ã son programme entre autre : activitÃ©s des ateliers de formation en art, le cinÃ©ma, le thÃ©Ã¢tre, de la danse, les arts plastiques, le carnaval et autre encore. je suis le 2eme dessinateur du togo nationale en 2009. A l’age de 7ans,j’avais commencer a dessiner et actuellement je n’ai que 16 ans. Mon reve:c’est d’aller en ecole des beaux arts en europe pour bien perfectionner mon talent pour meriter leus techniques pour que je puisse etre un artist celebre pour le monde. si il y a de l’aide,veuillez nous contacter par e mail adresse:BrightKpoha123@yahoo.com/facebook:bright kpoha. HELLO,AM ARTIST DESIGNER FROM TOGO,EVERYBODY LIKE TO SEE MY ART? This is the best rundown on the social discovery “space” in a really long time. It’s a weird moment: it’s real, it’s exploding, but there’s no “there” there. Anyways, reading your history of articles, you got a better handle on what the space actually is than most! Thanks for being such a good, and prolific, writer. And now that I’m following you on Twitter…funny!